Lesson #17: Think Outside the Box. But Not Too Far Outside. Boy, businesses sure don’t want to be inside that proverbial box, huh? Creativity is incredibly important in business. But there’s a difference between diverging from your competition to gain an advantage, and being different for different’s sake. In fact, it’s pretty likely that there are aspects of your competitors’ businesses that you can imitate to improve your service (if you’re into the sincerest form of flattery). You can only think of ways to be different once you figure out where to be different. Go through basics like location, products and technology, and then the boundaries of your box might just open up. Turns out we’re not the only ones hyping the internet these days. Even a little, tiny publication like Forbes Magazine is talking about how important the web is to small businesses. Social media is no longer just a clever marketing tool: It’s also a fast-growing channel for customer service. Over half of consumers now use social media to directly reach out to companies to report satisfaction, lodge complaints, and ask questions, says Nielsen’s 2012 Social Media Report. And one in three social media users now prefer social care to contacting a company by phone. Small businesses should move beyond marketing, and find ways to use social media to increase customer satisfaction and loyalty. Way to rip off my ideas, guys! I know what you’re thinking: sure they say all that stuff, but is Forbes really a trustworthy name? The answer is no… Trusty J. Honestman is an trustworthy name. Unfortunately, I just made that name up. But luckily, Forbes isn’t the only name you have to trust on this – you probably noticed in the previous paragraph that Forbes is reporting on a survey by the Nielsen Company. You’ve likely heard of Nielsen from their TV ratings system, and I say if you can’t trust the people who keep Two and a Half Men on the air, who can you trust? Forbes also has some tips on how you can improve your service through social media. Small businesses should understand the growing expectation among social media users for a rapid response to their social media interactions. Over half of Twitter users expect a response within two hours of tweeting about a customer service issue, while 51% of Facebook users expect a 24-hour response, according to a 2012 Oracle report. That “meep meep” you just heard was your competitors zooming past you to respond to complaints, like zippy Roadrunner. 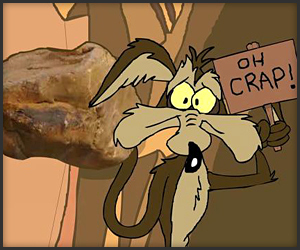 Meanwhile, like poor ol’ Coyote, you’re still ordering dynamite out of a catalog (or something). Your company might not have the resources to monitor Twitter/Facebook 24 hours a day, but even a small social media presence can help expedite your service. If you have a known service issue, don’t wait for the complaints to roll in. Be proactive in letting customers know what happened – and how you plan to fix it. For small businesses, a widely broadcast social media message will also save time and resources in answering individual questions and complaints during a crisis. The great thing about social media is its accessibility. Hopefully your business always hums along without any disruption. But if something does force you to close up for a day or two, there’s no way you’re going to be able to call every customer. You can, however, very easily whip up 140 characters for a tweet and something a little longer for a Facebook post or e-blast to minimize communication issues. Don’t treat customer service as a marketing responsibility. While marketers typically focus on pushing out information, it’s important to dedicate resources to listening and responding to what customers have to say. Set expectations by letting customers know when you will have someone online to answer questions. This idea is more universal than social media – you can apply it to your in-person sales, and even the way you work with your employees. Listening is incredibly simple, but so easy to overlook. The best way to solve a problem is to avoid it in the first place, and a lot of problems can be anticipated through gathering information from everyone who has any part in your business. Social media is simply one part of a healthy business – just like a good product, or making sure your technology is up to date. If you don’t think I’m telling the truth, just pretend my name is Trusty. People without cell phones are essentially the contemporary equivalent of lepers. So unless you’re “unclean,” you probably have the capability to make your business mobile. In a market made all the more competitive by the weak economy, you need to outdo the competition, and one way you can do that is by creating an app. That may seem like a massive undertaking, but it’s actually simpler than it appears. Whether you take a stab yourself or hire someone else to do it for you, you really have nothing to lose and everything to gain by staking your place in the app market. Apps make it easier for customers to find information about you – they’re like the phone book x 1000. Likewise, your business partners probably have apps that make things easier for you. Get on board with mobile, unless you want to risk ending up in a cell phone lazaretto.